A review of the security sector in the DRC and the role it can be expected to play in the country’s hoped-for democratic transition. This article is the fourth in a series that analyzes the ongoing challenges to the democratic process in the Democratic Republic of the Congo and how various actors and institutions will shape the outcome. Tension in the Democratic Republic of the Congo continues to mount after President Joseph Kabila crossed the threshold of his two-term limit without having secured a new mandate. Over the past two years, the regime’s supporters have deployed a wide range of legal, constitutional, and political maneuvers to extend the president’s term in office beyond constitutional restrictions. With weak constitutional and institutional checks and balances, but concerted and widespread opposition, the stage appears set for a continued political impasse. The security sector will be instrumental in navigating this crisis. This review takes stock of the security sector in the DRC and the role it can be expected to play in the country’s hoped-for democratic transition. Now 140,000 strong, the Armed Forces of the Democratic Republic of Congo (FARDC) was created out of the armed factions of the two Congo wars of 1996–1997 and 1998–2003. Military professionalism became a major area of concern for the international community, which, by 2010, had spent $14 billion to support rebuilding efforts, including security sector reform. In 2014, the European Union committed more than $1 billion to fund these initiatives through 2020. Additionally, the FARDC has at least 14 bilateral technical assistance agreements—one of the most sizeable military support packages on the continent. Despite these investments, the level of military professionalism remains low. During political protests in 2016, the FARDC cracked down on regime opponents, including on September 19, when more than 59 citizens were killed. Investigations found that the use of violence was systematic. Soldiers, whose identities were kept anonymous, told independent human rights monitors that they were ordered to conduct house-by-house searches of political opponents, arrest suspected protest leaders, and attack opposition party buildings. As the protests gathered momentum, senior officers coordinated the orders from a command center set up for the purpose. Salary bonuses were provided to motivate the soldiers. The army was involved in similar crackdowns on opponents in the run up to the 2011 elections and the widespread post-election violence that engulfed Kinshasa. The unrest eventually spilled into the east where a special battalion set up to quell unrest in the region suffered heavy losses when confronting opposition militias, deserted its positions, and then went on to conduct mass rapes of women and girls. The FARDC has also been entangled in a host of illicit activities, a function of poor pay and working conditions. Oxford University–based Congo analyst Phil Clark says that elements of the national army have, over the years, formed irregular economic and political networks with non-state actors involved in resource extraction, especially in the highly volatile east. A 2015 survey found that the Congolese army and at least one armed non-state group were both present at one of every three mines in the region at the same time. These deployments were overseen by local FARDC commanders to facilitate the extraction of minerals such as tin, tantalum, tungsten, and gold for private benefit. In other cases, local communities were forced to pay soldiers’ salaries by way of extortion at illegal road blocks. This practice, known locally as “lala salama,” or “sleep well,” is difficult to control or monitor given the poor state of infrastructure and the ease with which individual soldiers are able to set up barriers. DRC Republican Guard. Photo: Radio Okapi/John Bompengo. The elite presidential guard and the intelligence services have been a key feature of the Congolese security sector since the era of former strongman Mobutu Sese Seko. 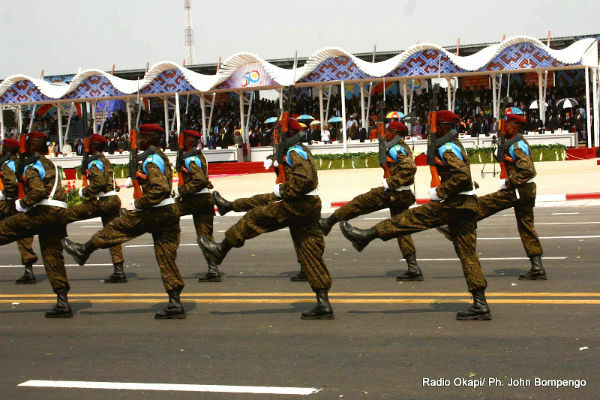 Kabila over the years has built a formidable Republican Guard (Garde Républicaine), formerly known as the Special Presidential Security Group, that most estimates put at division-strength. This feared institution is better trained, equipped, and paid than the FARDC, and its control runs outside the army chain and command. It is also seen as more loyal to the government than the army is, thereby serving as buffer against coups or professionally minded officers withdrawing support from the regime. The 12,000-strong Agence Nationale de Renseignements (ANR), the DRC’s national intelligence agency, plays a primary role in the regime’s calculus of survival. In an effort to break with the practices of Mobutu’s secret police and his large and intrusive civilian and military intelligence apparatuses, the 2005 Constitution confined the ANR to the gathering, analysis, and dissemination of intelligence. Intelligence agencies do not legally have the power to arrest, prosecute, or conduct politically directed investigations. Despite these controls, the ANR routinely carries out surveillance of political opponents and is deployed in anti-riot roles alongside the police and military. It has also been accused of widespread human rights violations, including beatings, torture, disappearances, and extra-judicial killings. The 2015 Report of the United Nations Joint Human Rights Office uncovered 142 violations against opposition and civil society members—a sharp spike from the previous year. Ninety-three of these were carried out by police and intelligence officers and the remainder by the military. Effectively controlled by the executive, the judiciary has been prevented from conducting independent investigations into these violations. The lack of redress and climate of politicization serve to further undermine public confidence and prospects of a democratic transition. The laws and regulations governing the police are spelled out in legislative texts. The Constitution provides for a police force that is independent, impartial, and accountable. Furthermore, it forbids police officers from engaging in private activities for financial gain, including serving on boards of private organizations. It also guarantees the right to protest, and to free expression. Police training, moreover, has been an important component of the country’s security sector reform efforts. The EU supported a comprehensive multiyear police training program that started in 2006 and ended in 2016. Despite these initiatives, the PNC largely remains in the mold of a partisan force that views its primary role as the protection of the regime. Along with the Republican Guard, the national police has been built up steadily over the years as part of an array of security institutions over which the presidency has direct control. It takes the lead in riot control and constraining opposition activities. The police chief for Kinshasa administrative region, Celestin Kanyama, who was placed under U.S. sanctions June 2016, reportedly earned the moniker “esprit de morts” or “spirit of death” because of the reputation of the institution he leads. Violent engagements between police and citizens are a constant feature of political conflict in the DRC. Legacies of this confrontational stance toward the public reinforce the notion that protests are a threat to the regime’s power and survival, and not a legitimate expression of dissent that is guaranteed and protected by the constitution. The record of Congo’s security apparatuses suggests that these institutions cannot be counted on to wield the instruments of state power in service of civilian protection and safety. Embedded legacies of unaccountable governance have rendered security bureaucracies highly vulnerable to partisan abuse and further reinforced a culture of using force to resolve political challenges. This is another institutional challenge reformers must navigate in order to realize a successful democratic transition. Fundamental reforms of these security institutions will be needed if the DRC is to become a stable and democratic society. Emile Ouédraogo, “Advancing Military Professionalism in Africa,” Research Paper No. 6, Africa Center for Strategic Studies, July 2014. Koen Vlassenroot and Valérie Arnould, “EU Policies in the Democratic Republic of Congo: Try and Fail?” Human Security Group Report, February 2016. William Clowes, “Smoke Bombs and Mirrors,” Slate.com, March 11, 2016. Henry Boshoff, “Supporting SSR in the DRC: Between a Rock and a Hard Place,” Netherlands Institute for International Policy, April 2010.